A NASA study revealed that West Antarctica’s key glaciers are in an irreversible retreat. The study analyzed 40 years of observations of six big ice streams draining into the Amundsen Bay and concluded that nothing now can stop them melting away. If the glaciers really do disappear, they would add roughly 1.2 m to global sea level rise. Prof. Eric Rignot said warm ocean water was relentlessly eating away at the glaciers’ fronts and that the geometry of the sea bed in the area meant that this erosion had now entered a runaway process. “We present observational evidence that a large section of the West Antarctic Ice Sheet has gone into a state of irreversible retreat; it has passed the point of no return,” the NASA glaciologist explained. The Amundsen Bay sector includes some of the biggest and fastest moving glaciers on Earth. 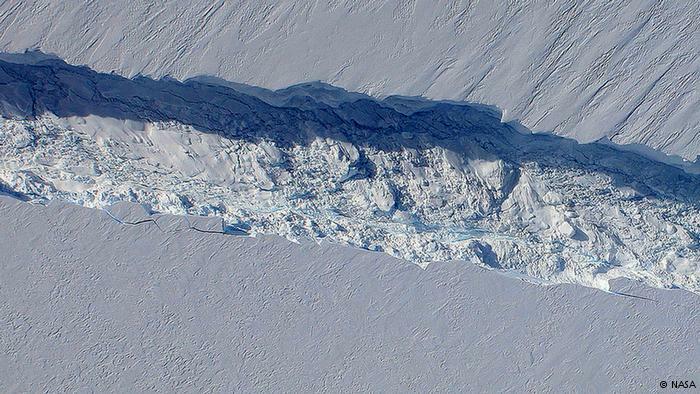 Pine Island Glacier (PIG), over which there has been intense research interest of late, covers about 160,000 sq km. Like the Thwaites, Smith, Haynes, Pope, Smith and Kohler Glaciers in this region – the PIG has been thinning rapidly. And its grounding line – the zone where the glacier enters the sea and lifts up and floats – has also reversed tens of km over recent decades. What makes the group vulnerable is that their bulk actually sits below current sea level with the rock bed sloping inland towards the continent. This is a geometry, say scientists, that invites further melting and further retreat. The new study includes radar observations that map the underlying rock in the region, and this finds no ridge or significant elevation in topography that could act as a barrier to the glaciers’ reverse. “In our new study, we present additional data that the junction of the glaciers with the ocean – the grounding line – has been retreating at record speeds unmatched anywhere in the Antarctic,” said Prof. Eric Rignot. The researcher, who is also affiliated to the University of California, Irvine, attributed the underlying driver of these changes to global warming. This, together with atmospheric behaviors influenced by a loss of ozone in the stratosphere, had created stronger winds in the Southern Ocean that were now drawing more warm water towards and under the glaciers. Dr. Tom Wagner, the cryosphere program scientist with NASA, said it was clear that, in the case of these six glaciers, a threshold had been crossed. “The results are not based on computer simulations or numerical models; they are based on the interpretation of observations,” he told reporters. Prof. Eric Rignot and colleagues put no real timescales on events, but a paper released by the journal Science to coincide with the NASA media conference tries to do just this. It does include computer modeling and was led by Dr. Ian Joughin, a glaciologist at the University of Washington’s Applied Physics Laboratory. The study considers the particular case of Thwaites Glacier. In the model, Dr. Ian Joughin’s team is able to reproduce very accurately the behavior of the glacier over the past 20 years. The group then runs the model forwards to try to forecast future trends. This, likewise, indicates that a collapse of the glacier is inevitable, and suggests it will most likely occur in the next 200 to 500 years.